Our three-week documentary photography course co-designed by Magnum Photos and LCC is underway, but what did the first week have in store for student Sanne Derks? Here, Sanne writes about seeking inspiration and capturing the unexpected. Fourteen students of twelve different nationalities have gathered in London for a three-week immersion in documentary photography. Alongside visits, lectures and classes, we have all been asked to carry out our own individual project around the theme ‘London Calling: A Sense of Place’. Roaming through the streets of central London, looking for frames to be shot, themes to be explored and projects yet to be revealed, where was the decisive moment that would tell me everything had fallen into place? Curiosity, perseverance and intuition would be needed to find a way through this jungle of possibilities. LCC Senior Lecturer Max Houghton encouraged us to take up a theme in line with our backgrounds. Despite the fact that I consider myself an atheist, religion has always had a tremendous attraction to me. Not only visually, but also theoretically. Not only did I do a Masters in the Psychology of Religion and a PhD in the Anthropology of Religion, I also like to take it up in my projects around the world. 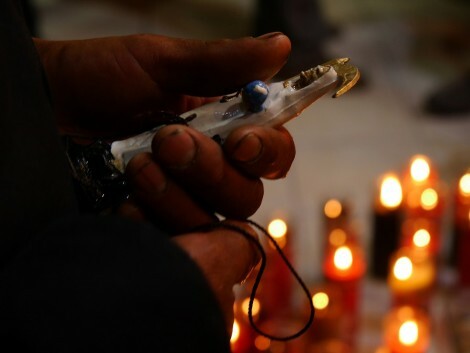 Rituals, festivals, and religious practices continue to intrigue me. Maybe it’s their exotic nature that appeals to me, which gives me the chance to learn about colourful worlds I would never have known without these projects. It gives me the chance to step out of my ordinary, simple and organised life and shows me a different perspective on life, embedded with meaning and emotions. Through the years I’ve learned that I am not so much interested in the dogmas and institutions, but more in the inventive ways that people apply religion to their daily lives, their practices and celebrations. To me it is a very appealing topic for photography, because it often goes together with colourful spectacles, intense emotions and a non-verbal expressive language that is beautiful to capture in images. In academia I struggled with finding the right argument to legitimise my research. How to convince people of the importance of studying religion, preferably in an exotic country far away from rainy dull Holland. Documentary photography might deal with the same issues. Our tutors Mark Power and Stuart Franklin also kept stimulating us to find a subject we truly felt passionate about. Stuart literally said: “If you don’t care about your subject, why would I?”. But being passionate is one thing. Having access is another. We only have three weeks, most of us come from outside London and we don’t know the city well. Relevant issues like documenting student prostitution or an awareness campaign for transgender discrimination might not be possible within the time given. Even shooting a shopping hall in south London encounters access issues. Unfortunately, we can’t all struggle for six months, like Edmund Clark did to get permission to shoot inside Guantanamo Prison in Cuba. Sometimes the themes just come to you. A coincidental meeting or encounter in the street can frame your mind. Suddenly they were there, through my viewfinder. A story started to unfold before my eyes and camera. 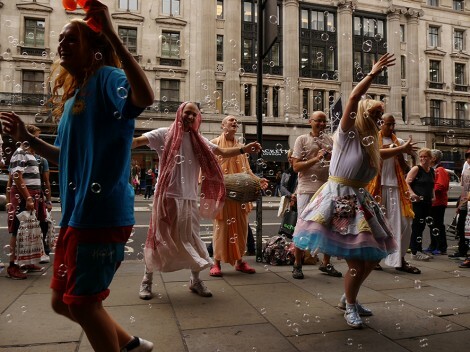 I stumbled upon a group of chanting Hare Krishnas singing, drumming and dancing through the streets of London. The split-second they appeared in my screen, I knew I had found the track I had to follow.